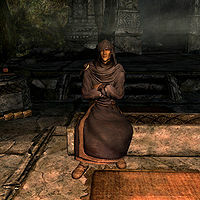 Aicantar is an Altmer conjurer, and is the nephew of Calcelmo. Like his uncle, Aicantar is heavily involved in Dwemer research, where he often spends time by his uncle's side or, in some cases, in Calcelmo's Dwemer Museum. However, he does not share all of his uncle's zeal for research. He wears blue mage robes and a pair of boots, and is equipped with an iron dagger. He carries a key to the Dwemer Museum, a key to Nchuand-Zel, and a selection of common loot and gold. He normally remains in Understone Keep with his uncle. Aicantar will introduce himself with: "I'm Calcelmo's nephew. I help him around the laboratory." He may also comment on his uncle's research, saying: "Don't let my uncle go on about his theories. You'll be here all night." or "I try not to think about how my uncle got all the Dwemer Centurion parts." or "I'm afraid to touch half of the things we keep in the tower." He says goodbye with: "Goodbye. Be careful if you head into the ruins." or "Back to my studies, then." Calcelmo: "What is it nephew? Can't you see I'm trying to think here?" Aicantar: "I just wanted to know if you needed anything." Calcelmo: "Um, no. Nothing. Nothing at all." Calcelmo: "Stop bothering me Aicanter [sic]!" Calcelmo: "Next season, nephew. Next season for sure...."
Aicantar: ""Next season for sure..." What? Uncle Calcelmo, I don't understand what you mean." Calcelmo: "The excavation, Aicantar! Right after I finish my book. We'll start excavating Nchuand-Zel again." Aicantar: "Could I maybe, skip the excavation, Uncle Calcelmo? I, uh, I just think you won't need me." Calcelmo: "Nonsense, you're a vital part of my research team. You'll be there, have no fear! Now, I don't want to hear another word of protest." During the quest Hard Answers, Aicantar will be present at Calcelmo's Laboratory, where unlike the guards, he will not be hostile, but evidently distressed by your breaking in. However, once you reach the Wizard's Tower, he will arrive with Captain Aquilius and two Wizard's Guards after you have duplicated the writing on Calcelmo's Stone, having alerted them to the presence of an intruder. All four will be hostile to you on sight, but you may choose not to engage them and run outside, as they will not follow. He will remain in the tower until the next quest in the Thieves Guild questline begins. Provided he is still alive following Hard Answers, he will return to his normal place at Calcelmo's side. Aicantar is identified as the backup Court Wizard, in case Calcelmo dies. However, since Calcelmo is essential and doesn't have a scripted death, Aicantar never provides merchant services during normal gameplay. He has set of dialogue that comes with his new position. He would instead greet you with: "Oh, excuse me. With my uncle gone, things are a bit of a mess." He would offer a look at his wares with: "Did you need something? A staff? Some enchanting materials?" or "I'm not half the wizard my uncle was, but I still have a few spells worth buying." If you reanimate Aicantar then lose him, he may reappear from thin air and drop dead after Hard Answers is complete. Adopted male children who are living in Markarth may comment "Aicantar let me see his museum. It's really nice." The author of Before the Ages of Man is named Aicantar of Shimerene. However, they are likely not the same person, as Aicantar of Shimmerene was the "Sapiarch of Indoctrination" and authored propaganda for the First Aldmeri Dominion in the mid-Second Era. This page was last modified on 11 March 2019, at 01:49.